Blue Tavern: 1206 N. Monroe St., Tallahassee, FL 32303 MAP facebook.com/bluetaverntallahassee (850)212-5204 Tallahassee's place to come hang out and talk, enjoy music six nights every week!, or simply have a quiet drink in between the hurly burly of everyday life. On most weeknights there will be a $2 cover. No "cover at the door," just a small fee collected at the bar. Of course, tips are always appreciated. All events are non-smoking / all-ages.One drink minimum purchase for evening events. Parking is free across the street or behind FedEx. A bike rack is next to the back door, well lit. We offer a wide variety of beers; the kitchen is open late featuring grilled sandwiches, New Orleans style red beans & rice, and Valence Street vegan stew. OPERATING HOURS: The bar is open from 4pm to midnight Monday-Thursday, and 4pm to 1am Friday & Saturday. FACEBOOK EVENT LIST. VIEW COMPLETE CALENDAR. UPCOMING HIGHLIGHTS: Every Monday: Lost Mondays w/ Belmont & Jones, 8-10pm, and sometimes, others. Like Mondays in April will be hosted by Jordan M. Young (4/8), Frank Lindamood (4/15), Reverend Robert (4/22), Hepzibah Jones (4/29) with pals Gin & Razor during the 2nd set (Eliza Schneider-Green, Kaye Rhinehart & Deb Berlinger). 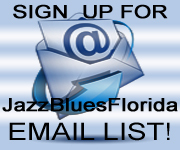 APR 20: Libby Rae Watson & Wes Lee - blues; 22: Rev Robert - blues; 27: Sam Pacetti - guitar. MAY 1: The Lucky Losers; 16: Ruth Wyand. Paradise Bar & Grill: 21 Via de Luna, Pensacola Beach 32561 MAP paradisebar-grill.com (850)916-5087. Bar and kitchen open daily from 11am-11pm. From local acts to bands from across the world, Paradise hosts a variety of music styles, ranging from blues to roots to funk. On Sundays, the bands start playing at 3pm, and every other night (Monday - Saturday), the live music starts at 6pm. All events are free and open to the public. "You never know who might be playing in Paradise!" Music nights are seasonal - check CALENDAR for shows. Paradise Inn, adjacent to Paradise Bar & Grill is a vintage waterfront motel providing a unique and classic Old Florida experience on the Emerald Coast. INFO & Reservations. APR 17 & 18: Lindsay Beaver & the 24th Street Wailers; 20: Jonathan Long; 21: Mike Norris; 23: Heather Gillis; 24, 25: Ben Prestage; 26: Paxton Norris Band; 27: Big Al & The Heavyweights; 28: Biscuit Miller & The Mix; 29: Bryan Lee; 30: Biscuit Miller & The Mix; MAY 10: Dash Rip Rock. Seville Quarter (Lili Marlene's): 130 E Government St, Pensacola, FL 32502 MAP sevillequarter.com Every MON: Monday Night Blues Presented by Blues Society of Northwest Florida. Free with Seville Quarter Membership Card or Normal Admission Charge after 8pm.